Gold's recent advance, fueled by geopolitical concerns (North Korea) and a delay from the Fed's credit tightening stance, the safe-haven metal has surged almost six percent in recent weeks. 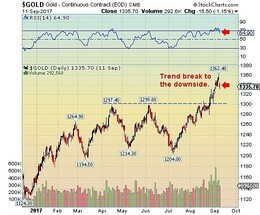 However, gold's rally appears to have reached a short-term resistance level. Technical models point to an overbought reading in early September. A similar level was also achieved in mid-April, just before a six percent decline. Bottom Line: The driving forces (North Korea, weak US$, Fed interest rate delay) for gold all appear to be playing favourably for the metal. For traders, look for a short-term pullback to $1300-$1350 as this rally starts to weaken. Add to positions on confirmation of support. For all other investors, we suggest remaining on the sidelines. 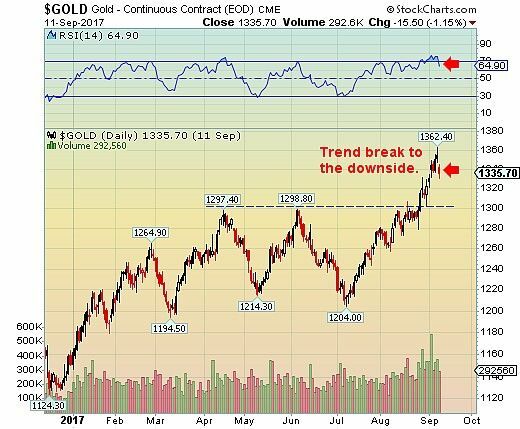 The current driving factors for gold can quickly shift leaving a short-term position into a long-term hold. The Fed will increase its interest rates again in early 2018 giving the greenback more tailwinds and playing against any long term movement in gold.